The Jacksonville, FL, Total Water Management Plan (TWMP), Segment 2 River Crossing Project, is a progressive design-build delivery of a massive directional drilling job that required the installation of 6,700 feet of 36-inch steel pipe under the St. Johns River. The success of this project ensured that the future of Jacksonville would not involve a fresh water supply deficit. Water for Jacksonville, FL is distributed through 36 water treatment plants and over 4,200 miles of water lines. JEA wanted to sustain the Floridian Aquifer for future generations, while continuing to serve the growing potable water needs of Jacksonville residents. The original design of the TWMP Segment 2 River Crossing Project called for a new 36-inch water main under the St. Johns River near the Mathews Bridge. The scope of work included approximately 4,300 LF of 36-inch welded steel water main constructed by horizontal directional drill from the west bank of the St. Johns River to Exchange Island, an unoccupied island in the middle of the St. Johns River. The route also included installation of approximately 900 LF of 36-inch water main by open-cut construction along Exchange Island from south of the Mathews Bridge (main bridge heading into downtown Jacksonville) to north of the Mathews Bridge. The final piece of the proposed route was approximately 1,600 LF of 36-inch welded steel water main constructed by horizontal directional drill from Exchange Island to the east bank of the St. Johns River at Rio St. Johns. This original base route was highly complex, more expensive, exhibited numerous environmental and permitting challenges, and required extensive marine support along with very specialized construction techniques. This second segment of a multi-phased project presented unique technical and logistical concerns. Running a pipeline 100 feet below the St. Johns River surface required specialized skills and materials. Manufacturing 6,700 linear feet of thirty-six-inch diameter steel piping and a horizontal directional drill—under the river—required assembling a team of industry experts. All of the resources needed to be organized, scheduled, and coordinated to minimize impact on city residents. JEA tapped Haskell—a proven partner—to accomplish the task. JEA reduced both risk and costs by selecting progressive design-build as their delivery method for this project. Haskell’s project management expertise allowed for smooth coordination with the Florida Department of Transportation and environmental permitting agencies. 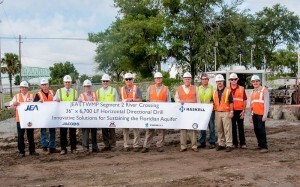 With Haskell’s assistance in executing a well-defined plan, JEA accomplished their goals and completed the project three weeks early. Haskell offered an alternate design route that consisted of a single HDD under the river from upland to upland on the south side of the Mathews Bridge. This alternate design included 6,700 LF of HDD from the east bank of the St. Johns River along Arlington Expressway (major highway funneling into downtown Jacksonville) to the west river bank. The project also included 190 feet of a 54-inch jack and bore under Arlington Expressway and the installation of approximately 1,439 LF of 36-inch water main by open-cut construction along the north side of Arlington Expressway. This alternate route cut costs by $5 million, shortened the schedule by 6-12 months, reduced environmental impacts, created a safer approach, and improved quality and system operability. “Haskell’s work on the Total Water Management Plan Segment 2 project has been outstanding. JEA would not have been able to complete a project of this magnitude without utilizing design-build project delivery methods and The Haskell Company’s expertise in delivering complex projects on-time and under budget in a design-build environment is outstanding. Constructing 6,900 feet of 36” steel water pipe under the St. Johns River, in a limited access FDOT roadway requiring construction activities to be coordinated with major entertainment function schedules of NFL football, baseball and state fairs at the Jacksonville Sports & Entertainment District was not easy and your team completed the tasks with professionalism and efficiency. JEA greatly appreciates the team that was assembled and the high level of competencies of the team members possessed to successfully complete the project.